When lastminute.com wanted a careers website that conveyed the brand as one of the ‘coolest’ in the UK, they asked WDAD to design and build it. To produce a recruitment website design that matched the style and panache of one of the most recognised web brands around and to provide a platform for their highly innovative ‘Spontaneity Champion’ campaign. The result was www.lastminutecareers.com. 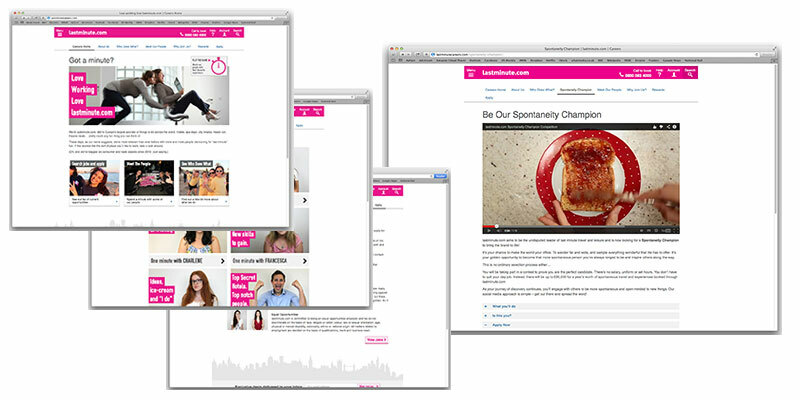 As well as being fully responsive, the site is visually-led with content delivered in easily and quickly digestible chunks such as one minute employee interviews, a one minute video, and also a simple one minute game with randomly positioned images of staff and their interests inviting the visitor to ‘match’ them. Upon launch the site also carried a page dedicated to a truly unique job opportunity; inviting applications to become their Spontaneity Champion. Visitors had to post a one minute film of themselves being ‘spontaneous’ to lastminute.com’s YouTube channel and invite the public to vote for them. A kind of Big Brother meets the X Factor competition! The prize was up to £50k on travel trips and experiences which the winner had to curate and share those adventures with the public at large on the company’s social media channels. The entire careers site had the budget of less than many campaign sites, but the end product has created a very positive and realistic first impression of the people and the culture at lastminute.com. The site had a ‘soft launch’ and after the first quarter had received over 7,500 unique visitors with the client reporting better informed candidates coming through the application process. As for the Spontaneity Champion campaign, when the competition closed, a total of 35,287 votes were cast before the winner was chosen from the top three.